Vascular dementia, which occurs after a stroke, is the second most common dementia type. But there are many other conditions that can cause symptoms of dementia, including some that are reversible, such as thyroid problems and vitamin deficiencies. We all know that drinking too much is bad for the body. How do you feel after a big night out drinking? Both imaging and neuropathology studies suggest excessive and prolonged alcohol use, contribute to structural and functional changes in the brain that are permanent. These changes may arise from direct toxicity (aka oxidative stress damage) on the brain or due to a deficiency in vitamin B1 (also known as thiamin, a critical vitamin needed for proper brain and nervous system functioning). A massive systematic review and meta-analysis of over 23 studies suggested that small amounts of alcohol may be protective against dementia and AD, yet are significantly linked to causing both VaD and cognitive decline. Further, their evidence suggests limiting alcohol earlier in life, confers a protective effect against dementia incidents later in life! In another study with 1709 participants, researchers found an increased monthly intake of beer significantly associated with dementia risk. Whereas, a monthly/weekly intake of wine was actually linked to a lowered risk. Could wine be protective? We do not know the answer to this question yet- but we do know that moderation is key as excessive drinking can be harmful to the body and the brain. 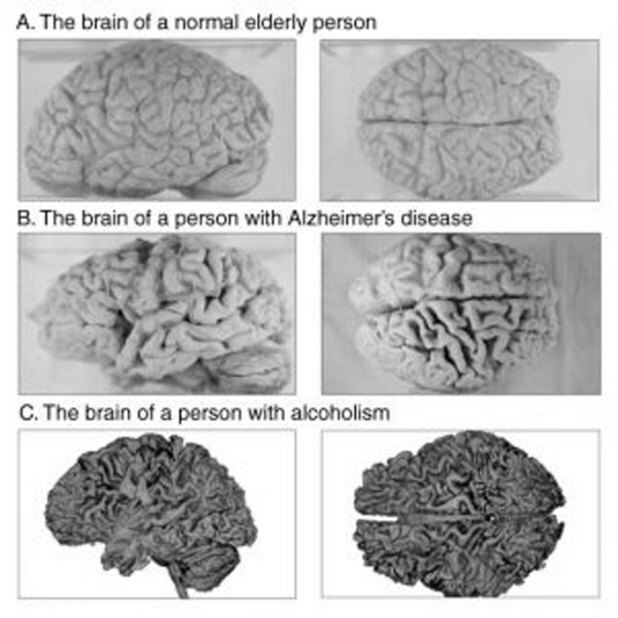 Compared with the brain of a normal elderly individual (Panel A), the wider grooves and narrower ridges of the brains in Panels B and C reflect the shrinkage of brain tissue seen in Alzheimer’s disease and alcoholism. SOURCE: Photographs in panels A and B courtesy of Sanders-Brown Center on Aging, University of Kentucky. What about early onset alcohol induced dementia? Yes, you heard me right! Early onset means being diagnosed with Dementia between the ages of 30-64. In Australia, they have reported 8 cases per 100,000 at risk. According to this research, the number is creeping up! Bottom line, if you enjoy a glass of wine, follow the guidelines recommended by large health educational bodies such as the National Health Society (NHS). The NHS recommended limits are currently a maximum of 14 units each week for men and women, spread over 3 or more days. However, lower limits are suggested for older people because their bodies handle alcohol differently. A small 125ml glass of wine is typically about 1.5 units and a pint of beer, lager or cider is usually 2-2.5 units. This would mean no more than 9 SMALL glasses of wine a week, and the wine is not to be consumed on just a Friday and Saturday night. ‘Don’t smoke! It’s so bad for your lungs, heart, and especially those tiny blood vessels that support your brain!’ Yes, we are talking about that pesky bad habit of the most addictive kind, smoking. In a massive systematic review of 37 studies, across all major medical databases, smokers had an increased risk of Dementia (compared to non-smokers)! Not surprising. There was no significant difference if you were a woman or man if you were a different race, or in a different geographical region. Did you know, that a report published over 25 years ago concluded that smoking could actually be beneficial in dementia? How things have changed!! In July 2014 the World Health Organization (WHO) in conjunction with the Alzheimer’s disease International Association (ADIA) stated that smokers are 45% more at risk of developing all forms of dementia compared to their non-smoker counterparts. The report states the more you smoke the higher the risk of you developing an all-cause dementia, and passive smoking may also increase your risk. Although it may look cool, or give you a temporary relaxing feeling, it is literally shrinking your brain! How many of you get enough sleep? 7-9 hours of sleep is what is recommended by the National Sleep Foundation for body and mind rejuvenation. Most of us do not achieve these suggested guidelines. This lack of sleep is catching up to us. 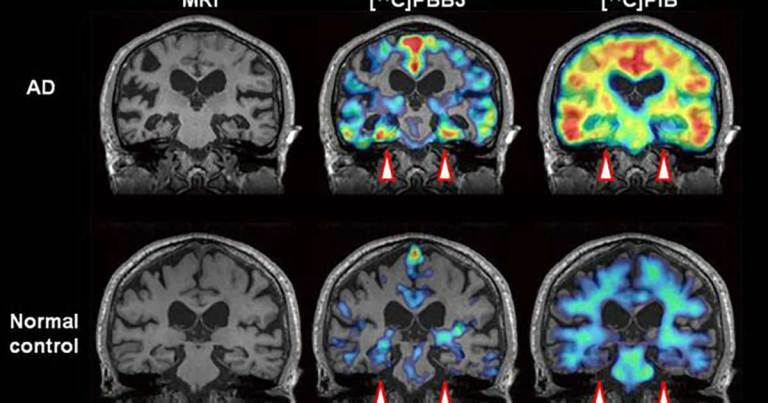 New research shows that less sleep equates to brain damage and cognitive decline. Let’s look specifically at people who have sleep apnea. Those who suffer from sleep apnea have disrupted breathing and pauses in the breath, where they are not taking a full breath of oxygen continuously. People who suffer from sleep apnea feel exhausted after a full night of sleep, snore and are usually overweight. One study with all women in the disordered breathing category were at higher risk of developing cognitive impairment versus those without sleep-disordered breathing. Less oxygen to the brain, less brain function. A 2015 study found that sleep-disordered breathing is associated with earlier age of mild cognitive impairment and earlier onset of AD. Further, the CPAP machine also known as the Continuous Positive Airway Pressure (CPAP) helps to delay the onset of cognitive decline. If you snore or experienced disrupted breathing it is best to go get it checked out! This bad habit increases your risk of memory loss!